Roxas occupied important positions in the Philippine government more than any other Filipino had ever held before him. For some thirty-six years he exercised authority as public official in various capacities, capping these with the highest office in the land. Starting in 1917 as a member of the municipal council of Capiz, he became the youngest governor of his province and served in this capacity from 1919 to 1922. The Roxas potential for national leadership became evident when he was elected President of the national league of governors. He was elected to the Philippine House of Representatives in 1922, and for twelve consecutive years was Speaker of the House. He was member of the Constitutional Convention 1934 to 1935, Secretary of Finance, Chairman of the National Economic Council, Chairman of the National Development Company and many other government corporations and agencies. He was a Brigadier General in the USAFFE, and Guerilla leader. Roxas was elected in 1941 to the Philippine Senate, but was unable to serve until 1945 because of the outbreak of World War II. During the war, he was made a liaison officer between the Commonwealth government and the United States Army Forces in the Far East headquarters of General Douglas MacArthur. Roxas also directed the resistance in Mindanao. Prior to Quezon's departure for the US, he was made Executive Secretary and designated as successor to the presidency in case Quezon or Vice-President Sergio Osmeña were captured or killed. Roxas was captured by the Japanese invasion forces in 1942. When the Philippines Congress was convened in 1945, the legislators elected before the war, in 1941, chose Roxas as Senate President. In the Philippine national elections of 1946, Roxas ran for president as the nominee of the Liberal Party (liberal wing of the Nacionalista Party). He had the staunch support of General MacArthur. His opponent Sergio Osmeña, who refused to campaign, saying that the Filipino people knew his reputation, lost to him in that 1946 election of April 23, Roxas won 54 percent of the vote. “If war should come, I am certain of one thing–probably the only thing of which I can be certain–and it is this: That America and the Philippines will be found on the same side, and American and Filipino soldiers will again fight side by side in the same trenches or in the air or at sea in the defense of justice, freedom and other principles which we both loved and cherished”. After the speech, he felt dizzy and was brought to the residence of Major General E. L. Eubank, where he died that same night. 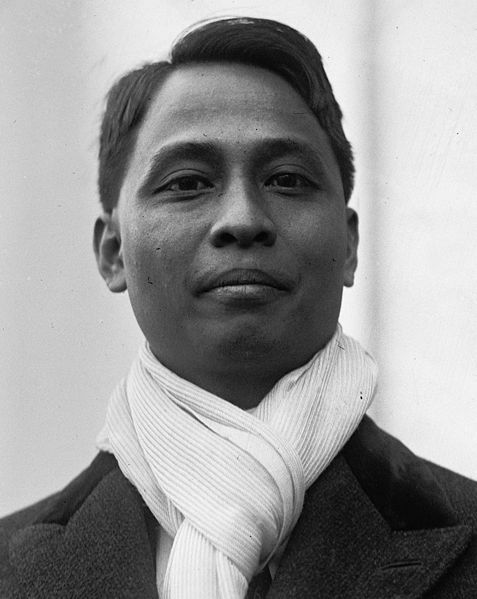 Manuel Roxas was married to Trinidad de Leon in 1921. The couple had two children, Ma. Rosario "Ruby" Roxas and Gerardo M. "Gerry" Roxas. Ruby married Vicente Roxas (no relation) and Gerry married Judy Araneta. Gerry became a House Representative and a leader of Liberal Party. He fathered three children, two of them (Dinggoy Roxas and Mar Roxas) who both served as Representatives of Capiz. Mar became a Senator in 2004, and was elected President of the Liberal Party of the Philippines in 2004.